Holland America Line’s first Signature-class cruise ship, ms Eurodam has delighted guests since her maiden voyage, and recently received many exciting updates, including new lounge, dining and entertainment venues, and completely refreshed suites. Guests now have even more world-class entertainment options than ever before. Live music has always been the heart and soul of evenings aboard Holland America Line, and Eurodam features the full Music Walk experience — with three exciting venues. Lincoln Center Stage, featuring world-class musicians performing chamber music, and Billboard Onboard, rocking the house with 50 years of chart-topping hits, join the already popular B.B. King’s Blues Club, which brings the best of Memphis blues to sea, and completes our new “Music Walk” experience. In addition to amazing evening entertainment, an array of activities allows you to pursue new interests or relax and rejuvenate. Enjoy onboard cooking shows and hands-on workshops in partnership with America’s Test Kitchen (available beginning May 2017). And explore the wonders of our world through exclusive BBC Earth natural history content through onboard activities, concerts and films. Learn how to edit, display and share your vacation videos and photographs through our Digital Workshop powered by Windows®. The Greenhouse Spa & Salon offers spa treatments, a thermal pool and lounge and a variety of salon services. Our fully equipped Fitness Center includes state-of-the-art cardio and weight machines, as well as classes in Yoga, Pilates, indoor cycling and more. On deck enjoy two outdoor pools, along with basketball and volleyball courts. Club HAL® provides a wide variety of youth and teen-friendly activities for kids ages 3 to 17, supervised by qualified, full-time staff. 2 lower beds convertible to 1 queen-size bed, bathtub, shower, sitting area, private verandah, floor-to-ceiling windows. Approximately 213–379 sq. ft. including verandah. Stateroom amenities include: Our signature Mariner’s Dream™ bed featuring plush Sealy Posturepedic® Euro-Top mattress and finely woven cotton linens. Luxurious bathrobes for use during your voyage. 100% Egyptian cotton towels. Premium massage showerhead. 5x magnifying lighted make-up mirror and salon-quality hair dryer. Fragrant soaps, lotions, shampoo and other bath amenities from Elemis Aromapure. Complimentary fresh fruit on request. Elegant ice bucket and serving tray for in-stateroom beverages. Flat-panel TV and DVD player. Ice service, shoeshine service and nightly turndown service. Note - Some rooms in the same category may have different furniture configurations and/or facilities. Room measurements are approximate. Please confirm before booking. 2 lower beds convertible to 1 queen-size bed, shower. Approximately 141–284 sq. ft. Stateroom amenities include: Luxurious beds featuring Sealy® Premium Euro-Top mattresses and finely woven cotton linens. Deluxe waffle weave and terry cloth bathrobes for use during your voyage. 100% Egyptian cotton towels. Premium massage showerheads. 5X magnifying make-up mirrors and salon-quality hair dryers. Fragrant soaps, lotions, shampoo and other bath amenities from Elemis Aromapure. Complimentary fresh fruit on request. Elegant ice bucket and serving tray for in-stateroom beverages. Flat-panel TV and DVD player. Ice service, shoeshine service and nightly turndown service. Note - Some rooms in the same category may have different furniture configurations and/or facilities. Room measurements are approximate. Please confirm before booking. 2 lower beds convertible to 1 queen-size bed, shower. Stateroom amenities include: Luxurious beds featuring Sealy® Premium Euro-Top mattresses and finely woven cotton linens. Deluxe waffle weave and terry cloth bathrobes for use during your voyage. 100% Egyptian cotton towels. Premium massage showerheads. 5X magnifying make-up mirrors and salon-quality hair dryers. Fragrant soaps, lotions, shampoo and other bath amenities from Elemis Aromapure. Complimentary fresh fruit on request. Elegant ice bucket and serving tray for in-stateroom beverages. Flat-panel TV and DVD player. Ice service, shoeshine service and nightly turndown service. Note - Some rooms in the same category may have different furniture configurations and/or facilities. Room measurements are approximate. Please confirm before booking. 2 lower beds convertible to 1 queen-size bed, shower. Approximately 141–284 sq. ft. Note: This category available in both Large & Standard. 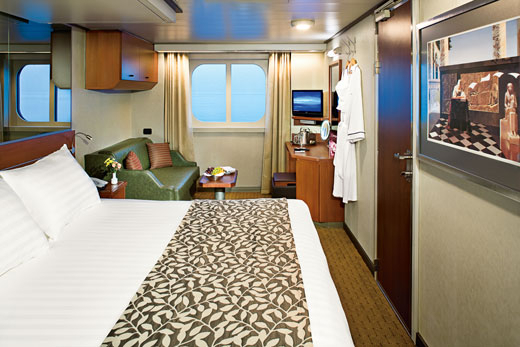 Stateroom amenities include: Luxurious beds featuring Sealy® Premium Euro-Top mattresses and finely woven cotton linens. Deluxe waffle weave and terry cloth bathrobes for use during your voyage. 100% Egyptian cotton towels. Premium massage showerheads. 5X magnifying make-up mirrors and salon-quality hair dryers. Fragrant soaps, lotions, shampoo and other bath amenities from Elemis Aromapure. Complimentary fresh fruit on request. Elegant ice bucket and serving tray for in-stateroom beverages. Flat-panel TV and DVD player. Ice service, shoeshine service and nightly turndown service. Note - Some rooms in the same category may have different furniture configurations and/or facilities. Room measurements are approximate. Please confirm before booking. 2 lower beds convertible to 1 queen-size bed, bathtub, shower. Approximately 169–267 sq. ft. Stateroom amenities include: Luxurious beds featuring Sealy® Premium Euro-Top mattresses and finely woven cotton linens. Deluxe waffle weave and terry cloth bathrobes for use during your voyage. 100% Egyptian cotton towels. Premium massage showerheads. 5X magnifying make-up mirrors and salon-quality hair dryers. Fragrant soaps, lotions, shampoo and other bath amenities from Elemis Aromapure. Complimentary fresh fruit on request. Elegant ice bucket and serving tray for in-stateroom beverages. Flat-panel TV and DVD player. Ice service, shoeshine service and nightly turndown service. Note - Some rooms in the same category may have different furniture configurations and/or facilities. Room measurements are approximate. Please confirm before booking. 2 lower beds convertible to 1 queen-size bed, bathtub, shower. Approximately 169–267 sq. ft. Note: This category has more than one view type. Stateroom amenities include: Luxurious beds featuring Sealy® Premium Euro-Top mattresses and finely woven cotton linens. Deluxe waffle weave and terry cloth bathrobes for use during your voyage. 100% Egyptian cotton towels. Premium massage showerheads. 5X magnifying make-up mirrors and salon-quality hair dryers. Fragrant soaps, lotions, shampoo and other bath amenities from Elemis Aromapure. Complimentary fresh fruit on request. Elegant ice bucket and serving tray for in-stateroom beverages. Flat-panel TV and DVD player. Ice service, shoeshine service and nightly turndown service. Note - Some rooms in the same category may have different furniture configurations and/or facilities. Room measurements are approximate. Please confirm before booking. 2 lower beds convertible to 1 queen-size bed, bathroom with dual sink vanity, full-size whirlpool bath, shower and additional shower stall, large sitting area, private verandah, 1 sofa bed for 1 person, floor-to-ceiling windows. Approximately 273–456 sq. ft. including verandah. Amenities include: Luxurious beds featuring Sealy® Premium Euro-Top mattresses and finely woven cotton linens. Deluxe waffle weave and terry cloth bathrobes for use during your voyage. 100% Egyptian cotton towels. Premium massage showerheads. 5X magnifying make-up mirrors and salon-quality hair dryers. Fragrant soaps, lotions, shampoo and other bath amenities from Elemis Aromapure. Complimentary fresh fruit on request. Elegant ice bucket and serving tray for in-stateroom beverages. Flat-panel TV and DVD player. Ice service, shoeshine service and nightly turndown service. A variety of firm, medium and soft pillows. No-host mini-bar for easy entertaining. Personalized cruise stationery. Oversized bath towels. One-touch telephone concierge service. Fresh flowers. Complimentary DVD library. Note - Some rooms in the same category may have different furniture configurations and/or facilities. Room measurements are approximate. Please confirm before booking. Bedroom with 1 king-size bed, oversize whirlpool bath & shower & additional shower stall, living room, dining room, dressing room, private verandah with whirlpool, pantry, 1 sofa bed for 2 persons, microwave, refrigerator, guest toilet, private stereo system, floor-to-ceiling windows. Approximately 1,357 sq. ft. including verandah. Amenities include: Complimentary laundry, pressing and dry cleaning throughout your cruise. Premium duvet, oversize bath towels and soft, cotton bathrobes and slippers. Gorgeous corsages and boutonnieres for the first formal night. Hors d'oeuvres served before dinner each evening on request. Binoculars and umbrellas for your use on the cruise. Cocktail party with ship officers. Priority boarding for tender ports of call. Special disembarkation service. Priority dining and seating requests. Exclusive daily breakfast service for suite guests only. High tea service in suite on request. A special Suite guest lunch event on cruises over 7 days in length. A very special amenity exclusively for guests cruising in a Neptune or Pinnacle Suite, the industry-leading Neptune Lounge features a private place to relax, socialize with other suite guests and enjoy the personalized service of a concierge. The fleet-wide lounges provide worktables, large screen television, library, sofas and chairs, refreshments throughout the day and wi-fi for a small charge. One-Touch 24-hour Concierge Service is available when the Neptune Lounge is closed. Note - Some rooms in the same category may have different furniture configurations and/or facilities. Room measurements are approximate. Please confirm before booking. 2 lower beds convertible to 1 king-size bed, bathroom with dual sink vanity, full-size whirlpool bath, shower and additional shower stall, large sitting area, dressing room, private verandah, 1 sofa bed for 2 persons, floor-to-ceiling windows. Approximately 506–590 sq. ft. including verandah. 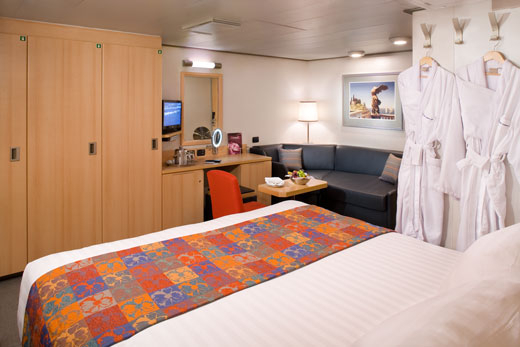 Suite amenities include: Complimentary laundry, pressing and dry cleaning throughout your cruise. Premium duvet, oversize bath towels and soft, cotton bathrobes and slippers. Gorgeous corsages and boutonnieres for the first formal night. Hors d'oeuvres served before dinner each evening on request. Binoculars and umbrellas for your use on the cruise. Cocktail party with ship officers. Priority boarding for tender ports of call. Special disembarkation service. Priority dining and seating requests. Exclusive daily breakfast service for suite guests only. High tea service in suite on request. A special Suite guest lunch event on cruises over 7 days in length. A very special amenity exclusively for guests cruising in a Neptune or Pinnacle Suite, the industry-leading Neptune Lounge features a private place to relax, socialize with other suite guests and enjoy the personalized service of a concierge. The fleet-wide lounges provide worktables, large screen television, library, sofas and chairs, refreshments throughout the day and wi-fi for a small charge. One-Touch 24-hour Concierge Service is available when the Neptune Lounge is closed. Note - Some rooms in the same category may have different furniture configurations and/or facilities. Room measurements are approximate. Please confirm before booking.